Spring is in the air and Summer is just around the corner. Time to enjoy your favorite fresh foods-Like Summer corn, grilled veggies and so much more. All flavored with the delicious buttery taste of I Can’t Believe It’s NOT Butter! 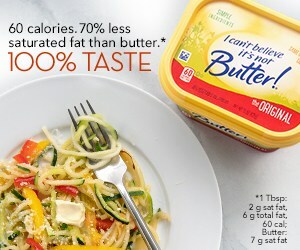 With 70% less saturated fat then butter and only 60 calories per serving.